The settlement’s formal opening took place on October 5, 1880,and the first issue of The Rugbeian followed soon after, in January 1881. July 2nd 1881 Rugby started to produce its own newspaper. Prior to that, from January until June 1881 the paper was printed in Cincinnati and shipped to Rugby by rail to be distributed. The eight-page paper was published monthly for the first few months, and became a four-page weekly in July 1881. The paper’s motto “Shoulder to Shoulder” was cited by Hughes, in his speech at the dedication of Rugby, in which he envisioned the settlers and Americans living and working together, shoulder to shoulder. No publishers or editors were named in the early issues of the Rugbeian, but Osmond Dakeyne is believed to have been the paper’s first editor. Some of the earliest copies of the paper have handwritten names attributed to many of the articles, with the majority of the editorial content contributed by W. Hastings Hughes (Thomas Hughes’ brother) and Osmond Dakeyne. The Rugbeian focused primarily on local news, but also published national news, and news from the ‘Old Country.’ Local businesses dominated the advertising space in the paper, but advertisements from further afield became more common as the paper grew. From February to June 1881, the front covers featured elegant illustrations depicting life in Rugby (reproduced from an article in Harper’s Weekly in October 1880). Present Day Print Shop Present Day Print Shop T. Baker of Huntsville related that his Grandfather, J. F. Baker of Huntsville purchased The Rugby printing equipment in 1892, following the closing of the shop there. He used this equipment to publish “The Cumberland Chronicle” from 1892 until 1918. One day in 1918 the editor had an argument with his printer who quit “on the spot” and later boarded the South-bound train from Oneida. As the train was departing the printing office was discovered in flames! End of the original Rugby equipment, and the “Cumberland Chronicle”. 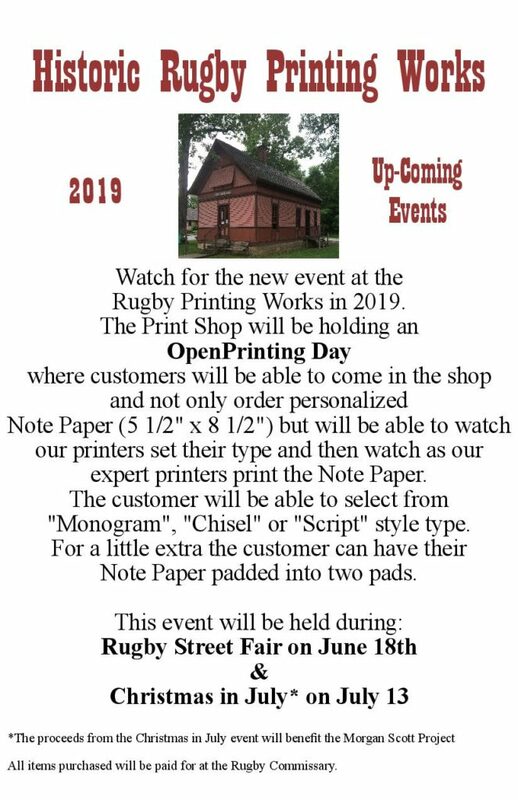 The present day Rugby Printing Works is housed in a building built in 1887 in nearby Deer Lodge, TN to house the local newspaper. “The Southern Enterprise”. That paper lasted only ten years after which the building was used for a variety of unrelated purposes – – Mostly for storing animal feed and hay. Fortunately the interior was not altered nor was the ornate exterior though a shed was added to the rear and a metal roof replaced the original wood shingle roof. In 1978 Historic Rugby acquired the building and moved it to Rugby, placing it on a sound foundation and taking steps to otherwise stabilize it. (the shed addition was removed at this time – prior to the move). 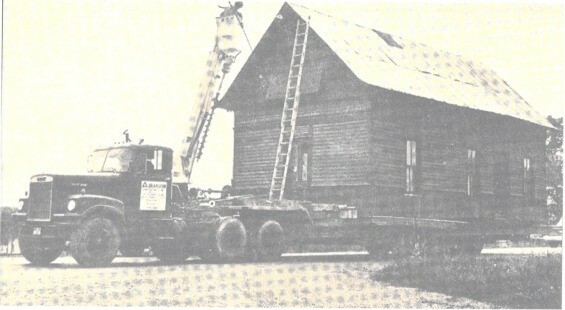 Rugby Printing Works Building being moved from Deer Lodge, 1978 Rugby Printing Works Building being moved from Deer Lodge, 1978 It should be mentioned that Deer Lodge was founded and developed by Abner Ross in 1884 – Ross having been the manager of the original Tabard Inn in Rugby. (Which burned in 1884.) Ross and a man named Mason started the “Southern Enterprise” in 1887 having constructed the building that is the present Rugby Printing Works, as a newspaper and printing office as they were commonly called at the time. The buildings size and interior layout is typical of many small-town newspapers of the late 19th – early 20th century. The rather ornate and detailed exterior is consistent of what might have been built in Rugby at that time. In 1978 Rugby procured the building from Deer Lodge and had it relocated the Rugby. In 1984 serious efforts began to restore the building for use as a “printing office”. John Gilliat, Rugby Properties Director, was in charge with much of the day-to-day labor being done by volunteers. In the course of a little over two years the exterior was restored to its original appearance including a new wood shingle roof, replacement of the ornate rafter ends on the west side of the building, some trim and exterior moldings were replicated by a very old shop in south Alabama using machines new when Rugby was new. Fortunately the interior required only a good cleaning and painting and some minor carpentry. It was at this time that the period wiring was done — as it probably would have been in 1948*** (or when electricity became available in the rural areas). During this time period the shop was often open on weekends and special events. Printing Works photos from 1982 (left and middle) and 1985 Printing Works photos from 1982 (left and middle) and 1985 A serious effort was now made to equip the shop as it would have been during the years of, and following Rugby’s founding. A typical “job press” (the Chandler and Price 8 x 12 was donated by Walter Clement, along with some type, type cases and such). Later (1989) a Washington Style hand press was located and its donation secured by Barbara Stagg. Dave Churchman, C.E.O. of Sterling Type Foundry (Indianapolis) donated several fonts of type, mostly the ornate styles of Victorian end, as well as numerous small cuts and “dingbats” of the correct period. The shop (Printing Office) has evolved over the years following the 1984 – 1985 beginnings of restoration into a typical working “Country Printing Office” as would have been in Rugby. 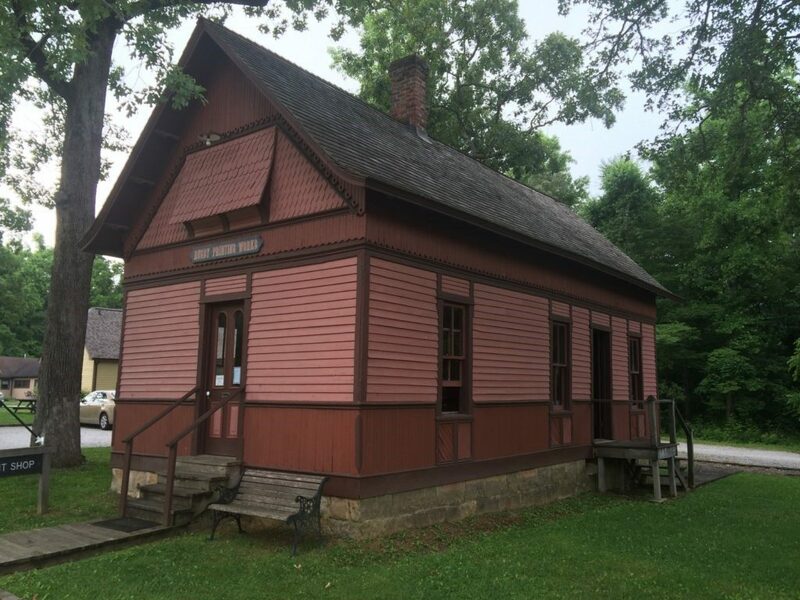 Over the years since the re-opening of the shop, various other needed items have been donated by individuals and some from The University of the South (Sewanee) to complete the shop as a typical working shop as it would have been in Rugby’s early days. *** http://www.mohaveelectric.com/content/history-mohave-electric Part 4 Spring 1989 – Print Shop Donation Received. Historic Rugby recently received two important vintage equipment donations for use in the Rugby Printing Works. Walter Clement (kneeling) examines the Washington press on the lawn of the Elk Valley Times before loading. Complete restoration of the press will take several months (years). Walter Clement (kneeling) examines the Washington press on the lawn of the Elk Valley Times before loading. Complete restoration of the press will take several months (years). Lakeway Publishing Company and one of its chain of newspapers, THE ELK VALLEY TIMES in Fayetteville, donated a long-sought Washington press. In the 1880’s, the Rugby Printing Works used this style press to print the weekly newspaper and for large job printing, such as posters. The circa 1860 press was made by the Cincinnati Typefoundry, which adds to its appropriateness for the Rugby Printing Works. Much of the equipment and supplies used by the early colonists was acquired and shipped to Rugby on the Cincinnati-Southern Railroad. After restoration of the Washington Press by Walter Clement, the press was placed in place for demonstration and actual job printing use. Clements, a recognized expert on Victorian printing techniques and equipment, has been working with Historic Rugby for the past seven years to authentically furnish the shop. Rossville Georgia, printer T. Burton Gaston has donated another needed shop furnishing – an 1880’s Paragon paper cutter and a number of antique composing pieces. Mr. Gaston became interested in Historic Rugby several years ago after learning of the efforts to authentically restore the printing works. With these combined donations, most of the appraise equipment needed to operate the shop as it was in the 1880’s is in hand. **** Other volunteers have helped, primarily during Festival (Spring) and Pilgrimage. Kenneth Hinson, a retired Nashville printer began coming in 1988, Burton and Elsie Gaston about 1990, local resident Paul Blevins was “on board” in 1984 and later joined by Gerald Hanwright in 1996 to keep the shop open. In recent years Julian Bankston a Rugby resident and Peter Merrill have put the shop in good order and are keeping it open on a regular basis, in doing so they are producing printed items needed by Rugby, thus making the shop a truly local “working shop”.